I am a big fan of Mexican beaches and love promoting the destinations to get more tourist to go. I feel us Mexicans should be responsible for promoting and recommending places in our own country. 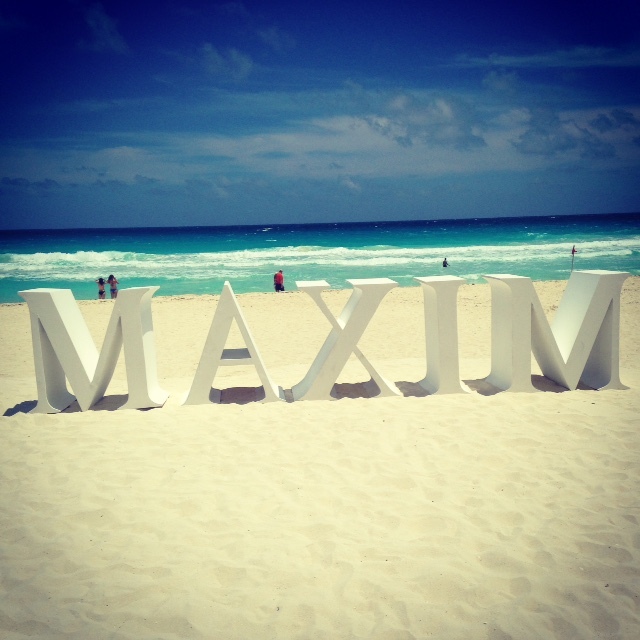 This weekend I was invited to Cancun for the Maxim Mexico Spring Party. It was a three day party to promote the magazine and enjoy the beach. The host hotel was ME Cancun. This hotel is similar to a W, its very modern and trendy. Its full of young adults who like to party and have a good time. The rooms are very comfortable the only complaint would be that as you would expect a party hotel is very noisy, I had to call our neighbors and ask them to quite down at 2 AM passing as a front desk agent. I guess that my days behind the desk paid off. ME Cancun is like most hotels in the area, an all inclusive hotel which is very comfortable for guests. You have all the meals and alcohol included and you just get to enjoy. The food is very good and they have several specialty restaurants, I tried Silk which is Asian Cuisine and loved it! We got several sushi rolls, some shrimp dumplings and mushroom fried rice. Everything we ordered was delicious. The restaurant also has teppanyaki which I strongly recommend if you have never tried it before. The hotel has the best beach club in Cancun which is a big bonus. The whole day on Saturday we hung out in the beach. They have big beds and a DJ playing all types of music. To get a beach bed you are usually asked for a bottle minimum and it’s a great opportunity to enjoy a ceviche or a tuna tataki. The white sandy beach and the crystal clear water makes it the ideal background to enjoy a day at the beach. The beach club gets extremely crowded especially on weekends so I would suggest to reserve a bed if you want to secure a spot. At night there is a night club next to the pool which is a great option to go out. Even though the party was private the place is big enough and many hotel guests where there. As a hotelier I try to be up to date on hotel openings and which are the best hotels where I go. Taking advantage of my trip to Cancun, I decided to go check out Nizuc Resort & Spa as I had heard wonderful things about it. We took a taxi from the ME and it took us 20 minutes to get to Nizuc. When we arrived we told the front desk we wanted to get a tour of the property and they where happy to give us one. There are no words to describe the beauty of this hotel, I can say this is one of the best I have ever visited. This hotel was originally planned to be an Aman Resort but somewhere along the way it purchased by Las Brisas Hotel Collection a well know Mexican hotel group. 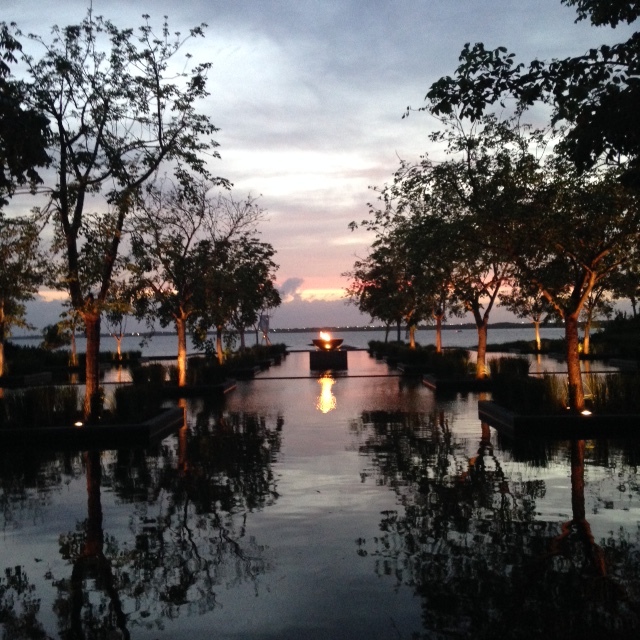 The minute you walk into the lobby you are awed by the view. The decoration consists of dark woods and minimalist furniture always keeping a clean line. The rooms are extremely spacious, there are different categories of rooms that offer different amenities, from terraces overlooking the ocean to private pools. The hotel has a special section for children, this way adults that prefer privacy and silence don’t get disturbed by any kids. The beach area feels secluded because of a coral reef that sits right in front of the hotel, you don’t get any big waves or noise from close by buildings. The ocean is perfect to swim in as it feels like a pool. I didn’t get to try the restaurants but you have several options from Mexican to Peruvian cuisine and a nice outdoor bar overlooking the ocean. I would definitely recommend this hotel for couples who want to get a unique experience in a romantic atmosphere without having to go to the French Polynesia. In my opinion this is one of the best hotels in Mexico. If you are in Cancun you should stop by for dinner and a tour of the property.